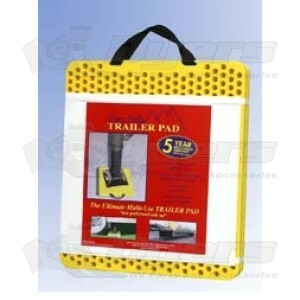 Super Dolly Bus pads provide a safe and easy way to prevent stabilizer legs from sinking into the ground. Weight tested to 100,000 lbs psi. Use under stabilizing legs of tractor trailers, busses or Class “A” Motor Homes. Pads are tested to handle up to 100,000 lbs psi. Always use with perforated side UP (smooth side down). 15” x 17” x 1” thick.